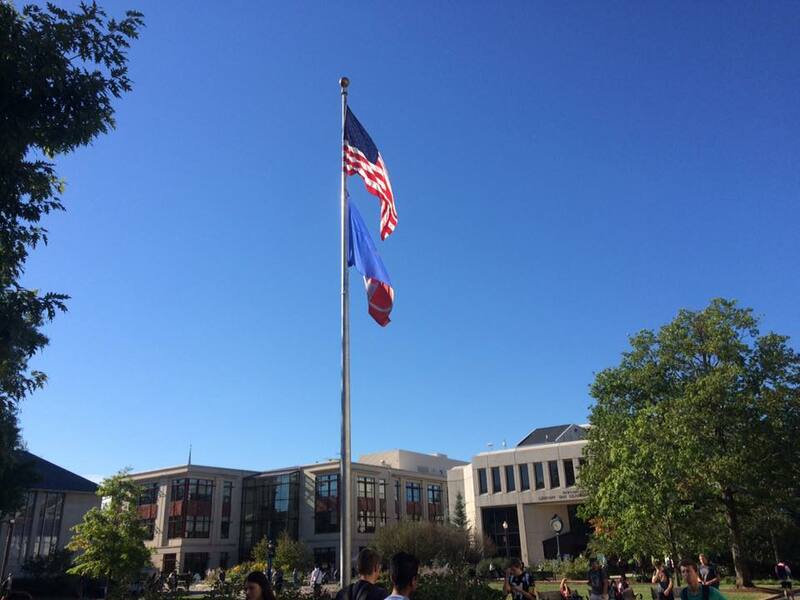 The American University community held its collective breath Wednesday afternoon as AU Public Safety, the United States Secret Service, and D.C. Police responded to reports of an “intruder” with an exposed sidearm near campus. All university properties were locked down, including the Spring Valley building and offices on both Connecticut and New Mexico Avenue. Students and employees were instructed to shelter in place or leave campus, if possible. Police units conducted a building-by-building sweep for the alleged intruder. After three hours, the search concluded and normal activity at AU resumed. No suspect was identified. AU might not be completely prepared for a serious emergency on campus. From the beginning of the campus lockdown, university administration experienced difficulties relaying emergency alerts to all students and staff. According to the university, AU alerts should be “automatically” sent to anyone who is affiliated with the school. The notifications come in both text and email format — and AU officials also maintain a social media presence during emergency situations. AU alerts did not immediately circulate when reports of the intruder first came in. In a tweet, the administration acknowledged this was due a technical problem and that it had been resolved. However, the Eagle reported that some students were not receiving text updates even after the issue had been addressed. The Katzen Art museum also noted in a Tweet that some staff were also not getting alerts after the supposed fix. AU’s emergency alert system is no stranger to technical glitches. A student told the Eagle that he hadn’t received university notifications on his phone since March, and mostly relied on Twitter for updates during Wednesday’s events. Twitter served as a hub of news and updates during the investigation process. The official AU account and several other affiliated pages posted regular updates on the search and status of the lockdown. AU Student Media also took point on keeping students aware of the developing situation on and off-campus. In an emergency situation, students should not have to rely on social media to assess whether or not they are in immediate danger on campus. An open forum like Twitter leaves far too much room for speculation and misinformation. The administration grappled with this pitfall on Wednesday as some newsrooms misreported the size and scope of the situation. Access to information is critical in an emergency — especially in a quickly-developing situation like one involving an armed individual. It’s one thing to have a solid set of procedures in place to react to these dangers (AU has these), but it’s another thing entirely to ensure their operational effectiveness when facing a real emergency. There appears to be a gap between the planning and execution of AU’s alert system — and that gap becomes a chasm during events like Wednesday’s. As AWOL reported in 2017, AU has been the target of threats and crimes in the past. Bananas hung from nooses, confederate flags and cotton stalks stuck to university walls, threats by white nationalists against our student government president — the community has already been attacked by outside forces on multiple occasions. Fortunately, none of these attacks have been physically violent. Yet. 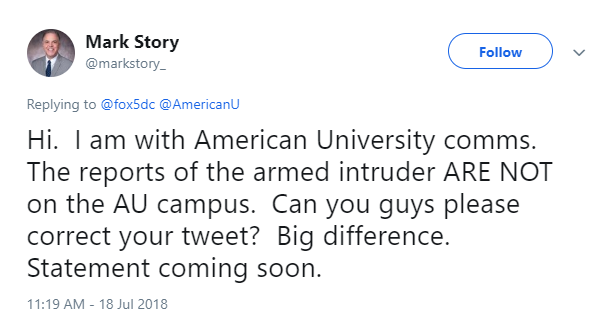 In the event that another intruder arrives at AU with the intention to do harm, the student body needs the security of knowing there is an effective and efficient alert system in place that will give them ample time to react to a quickly-developing situation and to get themselves and others to safety. The AU alert system should be streamlined and regularly tested to ensure that emergency information can be reliably provided to all students and staff. Ultimately, Wednesday’s events ended smoothly because of the diligent work of AU’s police forces and the professionalism of the local and federal authorities that assisted in the investigation. There is no question that AUPD is prepared to respond to a potential threat. The administration must address the issues plaguing the AU alerts system in the wake of Wednesday’s emergency — they may not get another chance.